A label-free electrochemical immunosensor for indole-3-acetic acid (IAA) detection in plant seeds was developed using the immunoreaction between IAA antibody and IAA. First, chitosan with many amino groups was immobilized on the gold nanoparticles modified gold electrode surface. Then, the activated butanedioic acid was captured by the covalent reaction between amino group in chitosan and one of the carboxyl groups in butanedioic acid. 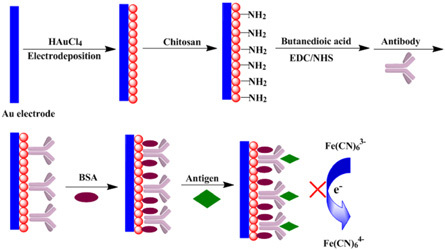 Subsequently, the IAA antibody was immobilized on the electrode using the covalent reaction same to chitosan and butanedioic acid. Differential pulse voltammetry was used to characterize the successful fabrication of the immunosensor. The experimental parameters, such as antibody concentration, antibody immobilization time, immunoreaction time, were optimized. With increasing the antigen concentration, the reduction current of the redox probe of Fe(CN)63- decreased, indicating that the antigen with carboxyl group bolcked the probe molecule diffused to electrode surface and increased the interface electron transfer resistance. The change of the reduction current of Fe(CN)63- showed linear relationship with the logarithm value of antigen concentration in the range from 5×10-6 to 1×10-8 mol/L. The detection limit was estimated to be 3.4×10-9 mol/L (S/N=3). The developed assay method showed high selectivity for IAA detection. Furthermore, the fabricated immunosensor was successfully applied to detect IAA in plant seeds.